is worth two in the bush?! Right, I think I'll take the rest of the day off! LOVE this!!! That flourish is gorgeous and the simple layout is fab. Think Mojo should stay in the pub - you don't need her going by this great card. Why are you not entering this into any challenges huh! Love this card simples but has style and class. Hugs Muver. p.s. I wanna that birdie die. The little birdie looks very at home on his flourish. Beautiful card! Love everything about this! Hope you have a great weekend! Lovin' those squares - such a fab fresh card, Faye! Well Faye, your naughty lack of mojo definitely hasn't affected your ability to make a wonderful card. I really love the design and those papers are so pretty together. I LOVE this one Faye! The scraps of paper, flourish, and bird....so perfect! 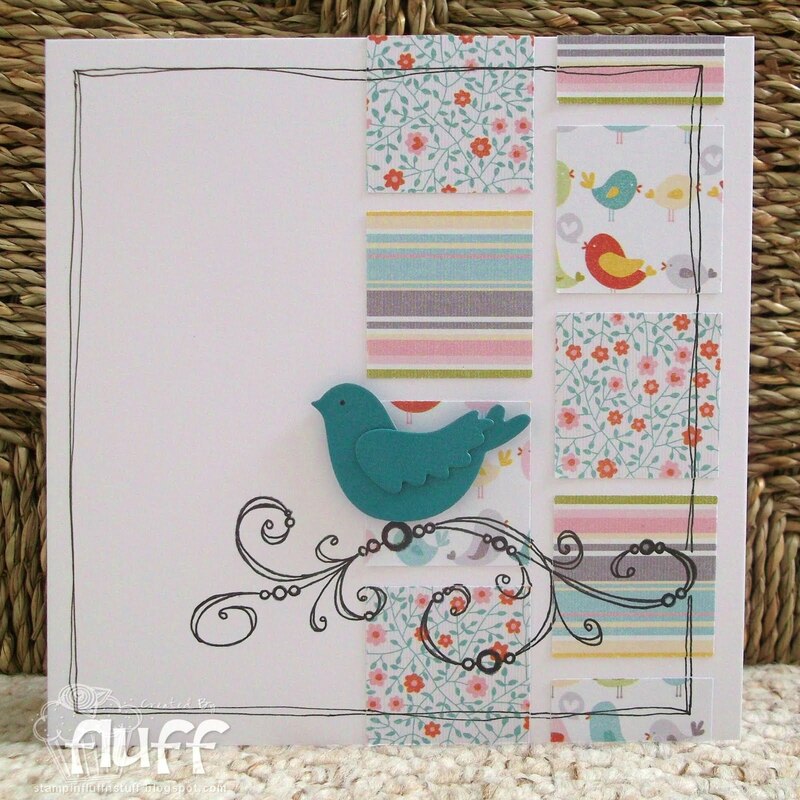 Faye this is too cute...I love the design and that cute little bird...great card. "wot you talkin bout willis?!" Fabolous card Faye,love the design!! Love the "vintage" flourish and having the bird perched on top is perfect. great piece Faye and love the flourish. stands out so well. Are you off to the pub for a drink with your friend Mojo? you might be able to persuade it to come home again!!! Very beautiful card! So elegant as well. I also love the design and the lightness of it. Love the doodling and that flourish is sweet, would never know it was from a xmas set. I think you need some new goodies to inspire you, tell VUH I said so, I'm sure it will make a difference. Super cute card!! I love the look of flourishes but seldom use them..need to figure it out!! Thanks for joining us over at the Poodle Parlour! !